Frequency domain analyses of EEG data in patients with generalized epilepsies have revealed a spectrum of results. Changes in terms of both spectral power ,,,, (including γ-frequency band) , and coherence , are reported in these. Except a few studies, , most studies comparing inter-ictal background power and coherence in generalized epilepsies with normal controls, have not specifically determined patients with JME as a separate group. Rather they have clubbed patients with JME, juvenile absence epilepsy, and epilepsy with exclusively generalized tonic-clonic seizures together. ,,,, Limited number of studies , which present separate results for JME patients have found both similar and contrasting findings compared to patients with idiopathic generalized epilepsy considered broadly. The present study attempts to study inter-ictal background quantitative EEG measures and its relation with clinical characteristics like age of onset of seizures, frequency of seizures, etc. Relationship with "duration of untreated epilepsy" (DUE) also has been additionally investigated. We conducted this study with the aim of comparing inter-ictal absolute spectral power in various frequency bands globally as well as in different brain regions and global field coherence between patients diagnosed exclusively with JME and healthy controls and correlating significantly different quantitative EEG measures with various clinical characteristics including DUE and standard EEG abnormalities. Clinical and EEG data were collected from patients, who were recruited by purposive sampling from the epilepsy clinic of the Central Institute of Psychiatry (CIP). Data from 10 right handed adolescent and young subjects, having a diagnosis of JME were taken up for the study. Inclusion criteria for the diagnosis of JME were: (1) clinical evidence of generalized seizures with myoclonic jerks with or without absence seizures; (2) no evidence of focal neurological or intellectual deficit; (3) normal brain imaging (CT/MRI, if performed). Exclusion criteria were: (1) presence of focal neurological or intellectual deficits; (2) abnormal imaging; (3) myoclonic jerks secondary to cerebral hypoxia, metabolic or degenerative diseases. Patients having comorbid-substance dependence (excluding nicotine and caffeine) and one or more seizures in the last 5 days were also excluded. The healthy control group included 10 right-handed subjects, age matched to patients, recruited from the community living in the vicinity of CIP. Healthy controls were screened with General Health Questionnaire (GHQ)-12;  only those with scores less than 3 were included. Other exclusion criteria for participation in healthy control group were the presence of any present, previous, or family history of neurological (including any kind of seizures) and psychiatric illness. Handedness was assessed using the Sidedness Bias Schedule (SBS) - Hindi version. Informed consent was taken from all participants and from responsible adults in case of minors. Detailed clinical and family history of epilepsy was taken. Myoclonic jerks (MJ) were physically demonstrated and the possibility of tremors and clumsiness of hands on awakening was looked into. A 32-channel EEG recording was done according to the international 10-20 system referred to linked ear lobes 4 weeks after their first contact to epilepsy clinic CIP i.e. 4 weeks of start of appropriate treatment in terms of particular drug or combination of drugs and dosage chosen. Eye movement potentials were monitored using right and left electro-oculogram (EOG) channels. Electrode impedance was kept <5kΩ. EEG was filtered (time constant -0.1 s, high frequency filter - 120 Hz) and digitized (sampling rate -512 Hz, 16 bits) using Neurofax EEG-1100K (Nihon-Kohden, Tokyo, Japan). The EEG included 3 min of hyper-ventilation (HV) and photic stimulation from 1 to 30 flashes per second. One senior resident and one consultant independently read all the EEGs and findings with agreement were reported. EEGs were classified as either "normal" i.e. showing normal background activity and no epileptiform discharges or "abnormal" i.e. showing generalized or focal paroxysms of single or multiple spike wave activity or showing sharp wave discharges or intermittent or diffuse θ or δ activity. 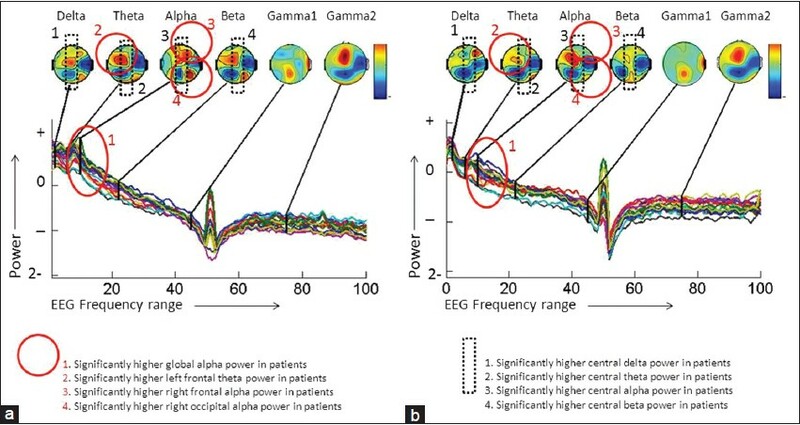 First 60-s epochs of epileptiform activity- and artifact-free background EEG data were visually selected from each recording after carefully excluding segments with eye movement, blink, and electromyogram (EMG) movement, electrode, perspiration artifacts, or drowsiness changes, and the above-mentioned abnormal responses. Selected EEG epochs were re-computed against common average reference. Spectral power, expressed in μV, (Fast Fourier transform routine, Hamming window) and global field spectral coherence were calculated using Welch's averaged periodogram method. Frequencies between 0.1 and 100 Hz were analyzed, divided into δ (0.5-4 Hz), θ (4-8 Hz), α (8-12 Hz), β (12-30 Hz), γ1 (30-60 Hz) and γ2 (60-100 Hz) bands, with a resolution of 0.25Hz. Spectral power was averaged region-wise (right and left frontal, parietal, temporal and occipital, and central) while coherence was computed as global field coherence. MATLAB 6.5 version (The MathWorks, Inc., MA, U.S.A.) was used for EEG analysis. Group differences in various socio-demographic and clinical variables for the continuous and categorical variables were computed using independent t-test and Fisher's exact test, respectively. As the spectral power and coherence data were not normally distributed (Shapiro-Wilk test), normalization was achieved by log and Fisher's z transformation, respectively, as recommended by "neurometrics." , Independent t-test was used to compare the groups on spectral power and coherence data (transformed). Spearman's correlation coefficients were computed between various clinical and non-transformed spectral power and coherence parameters. The level of significance was kept at 0.05. Statistical analysis was done using Statistical Package for Social Sciences version 10.0 (SPSS, Inc., Illinois, USA). Group comparison of socio-demographic variables is given in [Table 1]. No significant differences were found on any of the variables. Majority of the sample consisted of subjects hailing from rural and semi-urban domicile. Mean age of onset of myoclonic seizures was 13.00 (SD 2.89) years; this was their mean age of epilepsy onset as well and mean age of GTCS onset was 14.45 (SD 2.36) years. Mean duration of epilepsy was 5.40 (SD 3.893) years and mean DUE was 30.90 (SD 14.836) months. Frequency of myoclonic seizures ranged from 2 to 35 per month and frequency of GTCS ranged from 1 per week to 1 per 4 months. Absence seizures were noticed in 3 (30%) of the patients. Eight (80%) patients were on valproate monotherapy whereas one patient was on valproate and levetiracetam combination and another was on lamotrigine and clobazam combination therapy. Three (30%) subjects in the patient group had comorbid psychiatric illness: one had moderate depression for which the patient was on additional drug-mirtazapine (15 mg); two patients had inter-ictal psychosis for which they were on haloperidol (5 and 10 mg each). Family history of generalized epilepsy was present in 3 (30%) patients. No family history of any psychiatric or neurological disorder was reported in any of the subjects. Seven (70%) of the ten patients had abnormal inter-ictal EEG on standard analysis. Two had generalized spike, poly-spike, or spike-slow wave complexes; two had generalized slowing; two had bilateral fronto-central spike and poly-spike complexes; and one patient had fronto-centro-temporal slowing. All subjects in the normal group were reported to have a normal EEG. Particularly, in the study of EEG measures in idiopathic generalized epilepsies, description of only statistically significant results might result in loss of useful information;  hence, in addition to statistically significant results, trend level differences are also presented here. Comparison of global power and global field coherence in the 6 EEG frequency bands is shown in [Table 2]. Global power in the α-frequency band was significantly higher (t = 2.19; P < 0.05) in the patient group compared to controls. Global power in θ-band was higher at trend level in the patient group. Global field coherence was significantly higher in the patient group across α (t = 2.15; P < 0.05) and γ1 (t = 2.15; P < 0.05) frequency bands. Trend level higher global field coherence was noted in θ- and δ-bands in the patient group. 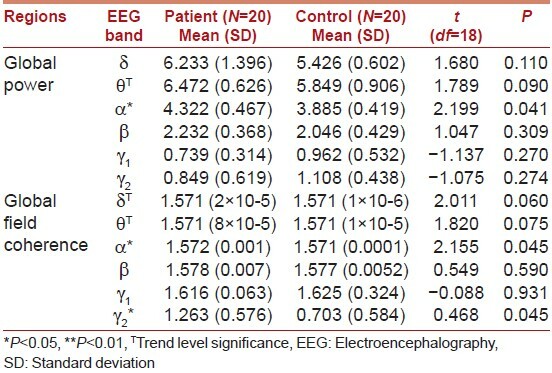 [Table 3] shows comparison of spectral power in the various EEG frequency bands across various brain regions. [Figure 1] shows comparison of spectral power (depicted using surface EEG spectral maps created with ''eeglab'' application of MATLAB) in various frequency bands between the two groups. Subjects in the patient group showed significantly higher spectral power in frontal α (right: t = 2.29; P < 0.05 and left: trend level) and θ (left: t = 2.26; P < 0.05 and right: trend level) bands. Left temporal region in the patient group had trend level higher power in θ- and δ-bands. Right occipital region in the patient group had significantly higher power in α-band (t = 2.17; P < 0.05) and trend level higher power in δ and γ1 bands. Central region in the patient group showed significantly higher power in δ (t = 2.95; P < 0.01), θ (t = 4.78; P < 0.001), α (t = 5.92; P < 0.001) and β (t = 3.45; P < 0.01) frequency bands and trend level higher power in γ2 band. Left frontal (ρ=0.722; P = 0.018) and central (ρ=0.646; P = 0.044) θ power had significant negative correlation with the presence of absence seizures. Significant correlation was noted between central δ (ρ=0.722; P = 0.018) and θ (ρ=0.646; P = 0.044) power and presence of psychiatric comorbidity. Frequency of myoclonic seizures showed significant correlation with central θ power (ρ=0.656; P = 0.039). No significant correlation was found between quantitative EEG measures and other clinical variables including DUE and visually analyzed EEG abnormalities. We found that JME patients had a higher global power in the α (statistically significant) and θ (trend level) frequency bands. α-activity is proposed to be modulated by cholinergic, serotonergic, and glutamatergic neurons. On the other hand, glutamine, γ-aminobutyric acid , and acetyl choline  are implicated in θ-oscillations. Clemens et al. (2012)  reported insignificantly higher overall δ-θ power in JME patients and attributed this finding to ''mild diffuse epileptogenic state,'' which was postulated to be secondary to abnormal amino acid concentrations within the entire cortex by Gloor in 1979. We support this justification and further suggest that significant increase in global α-power as found in our study might also be ascribed to Gloor's concept. Magnetic resonance spectroscopy studies  revealed that a network, which comprise of both cortical and sub-cortical areas, is implicated in JME patients. Using magnetic resonance imaging, frontal regions in patients with JME have been reported to have both cortical , and sub-cortical , abnormalities. These abnormalities might explain the possible dynamics underlying higher spectral power in frontal α- and θ-bands in JME patients as found in the present study. Clemens and co-workers (2012)  suggested that a non-lesional abnormality, which is responsible for generation of myoclonic seizures, might exist in the posterior part of the cortex including parietal and occipital lobes, and they proposed that increased θ-activity in this region may be an endophenotype for JME. Increased θ-activity (trend level) in the left temporal region was found in our study too along with significantly higher α-activity in right occipital region. Specific neurotransmitters are involved in generation of θ- and α-activity ,,, as described in the previous sub-section of discussion; along with these, hippocampus has been found to be an anatomical substrate specifically implicated for both θ- and α-activity. Now, there exists a possible link between JME and mesial temporal lobe epilepsy. Findings from temporal and also, occipital regions in our study point toward some not-yet-defined structural aberrations in these regions. EEG-fMRI has been used in the past to study epileptic networks (for review see Gotman (2008)). These studies suggest that brain areas, well beyond the presumed region in which they are generated, are affected. Specific research by means of such advanced neuroimaging techniques targeting posterior areas of the brain using inter-ictal background EEG are likely to be helpful in discovering specific structural aberrations. Significantly higher δ-, θ-, α-, and β-power in central regions in JME patients is a novel finding. However, significantly higher fronto-central α- and β-power have been reported in patients with epilepsy with grand mal seizures on awakening and juvenile absence epilepsy. Additionally, we found that the presence of absences was negatively correlated with frontal and central θ. This indicates that the inter-ictal functional networks underlying absence seizures in juvenile absence epilepsy and in JME are diverse. Most of the earlier studies on inter-ictal EEG and JME have excluded patients with psychiatric comorbidity; actually though there is 20-40% increased risk for psychiatric comorbidity in patients with epilepsy. Our study found that central δ- and θ-power in JME patients had significant correlation with presence of psychiatric comorbidity. This might explain the sparse significant findings on these frequency bands in central regions. Only a few studies in this research area , have studied the measure of coherence. Decreased δ-θ,  increased θ and decreased β global coherence measures are reported in literature along with anteriorly decreased and posteriorly increased coherence measures in θ-α-β frequency range. However, these studies have included patients with generalized epilepsy broadly and have not exclusively determined whether patients with specific diagnosis like JME are different in their expression of EEG coherence. We in our study found that global field coherence was significantly higher in the patient group in α-and γ1 -frequency bands. This is discordant with any of the known patterns of altered coherence in generalized epilepsies. However, results of our study also showed that there was trend level higher global field coherence noted in θ- and δ-bands in patient group which to some degree support the findings reported earlier. These findings suggest that both slow and fast diffuse EEG activity is hyper-synchronous and hyper-coherent in patients with JME. Valproate and lamotrigine were the major drugs on which patients in our study were treated. Both valproate and lamotrigine are known to decrease EEG power in various frequency bands. ,,, Further valproate related change has significant correlation with degree of the initial abnormality. These abnormalities are demonstrated after 3 months of treatment. EEG recording in our study was done after 4 weeks of initiating appropriate treatment; although the duration was not long so as to cause significant change, it was a prominent limitation in our study. Also, no reliable details of previous treatment received was available with us; drugs previously received also would have affected the EEG parameters. Another major limitation of our study was smaller sample size, which limits the generalizability of our findings. Power (global α and θ, frontal α and θ, left temporal θ, right occipital α, δ and γ1 and central δ, θ, α, β, and γ2 ) and coherence (global α and γ1 ) was higher in JME patients when compared to controls. Most of these results support the findings of earlier studies while some do not. Findings on global and frontal power point toward a "mild diffuse epileptogenic state" in JME patients. Findings on temporal and occipital power supports the concept that increased θ-activity in this region may be an endophenotype for JME and demands further research by means of advanced neuroimaging techniques using inter-ictal background EEG targeting structural aberrations in posterior areas of the brain. Significant correlation of central δ- and θ-power with the presence of psychiatric comorbidity explains the lack of significant findings in earlier studies on spectral power in these frequency bands in central regions as most of the earlier studies had excluded this comorbidity. Central θ-power is related to the progression of JME and it does not reflect pre-existent, causative pathology because of its significant correlation with frequency of myoclonic jerks. Duration of epilepsy, DUE and most other clinical variables do not correlate with spectral EEG measures significantly. 1. Proposal for revised classification of epilepsies and epileptic syndromes. Commission on Classification and Terminology of the International League Against Epilepsy. Epilepsia 1989;30:389-99. 2. Janz D. Epilepsy with impulsive petit mal (juvenile myoclonic epilepsy). Acta Neurol Scand 1985;72:449-59. 3. Janz D. Juvenile myoclonic epilepsy. Epilepsy with impulsive petit mal. Cleve Clin J Med 1989;56(Suppl Pt 1):S23-33. 4. Janz D, Durner M. Juvenile myoclonic epilepsy. In: Engel J Jr, Pedley TA, editors. Epilepsy: AComprehensive Textbook. Philadelphia: Lippincott-Raven Publishers; 1995. p. 2389-400. 5. Grünewald RA, Chroni E, Panayiotopoulos CP. Delayed diagnosis of juvenile myoclonic epilepsy. J NeurolNeurosurg Psychiatry 1992;55:497-9. 6. Delgado-Escueta AV, Serratosa JM, Medina MT. Juvenile myoclonic epilepsy. In: Wyllie E, editor. The Treatment of Epilepsy: Principles and Practice. 2 nd ed. Baltimore MD: Williams and Wilkins; 1996. p. 484-501. 7. Aliberti V, Grünewald RA, Panayiotopoulos CP, Chroni E. Focal electroencephalographic abnormalities in juvenile myoclonic epilepsy. Epilepsia 1994;35:297-301. 8. Genton P, Salas-Puig X, Tunon A, Lahoz C, Del Socorro Gonzales Sanchez M. Juvenile myoclonic epilepsy and related syndromes: Clinical and neurophysiological aspects. In: Malafosse A, Genton P, Hirsch E, Marescaux B, Broglin D, Bernasconi R, editors. Idiopathic Generalized Epilepsies: Clinical Experimental and Genetic Aspect. London: John Libbey; 1994. p. 229-51. 9. Inoue Y, Seino M, Kubota H, Yamakaku K, Tanaka M, Yagi K. Epilepsy with praxis-induced seizures. In: Wolf P, editor. Epileptic Seizures and Syndromes. London: John Libbey; 1994. p. 81-91. 10. Nuwer MR. Quantitative EEG: I. Techniques and problems of frequency analysis and topographic mapping. J Clin Neurophysiol 1988;5:1-43. 11. Clemens B, Szigeti G, Barta Z. EEG frequency profiles of idiopathic generalised epilepsy syndromes. Epilepsy Res 2000;42:105-15. 12. Clemens B. Pathological θ oscillations in idiopathic generalised epilepsy. Clin Neurophysiol 2004;115:1436-41. 13. Clemens B. Valproate decreases EEG synchronization in a use-dependent manner in idiopathic generalized epilepsy. Seizure 2008;17:224-33. 14. Willoughby JO, Fitzgibbon SP, Pope KJ, Mackenzie L, Medvedev AV, Clark CR, et al. Persistent abnormality detected in the non-ictal electroencephalogram in primary generalised epilepsy. J Neurol Neurosurg Psychiatry 2003;74:51-5. 15. Willoughby JO, Fitzgibbon SP, Pope KJ, Mackenzie L, Davey M, Wilcox RA, et al. Mental tasks induce γ EEG with reduced responsiveness in primary generalized epilepsies. Epilepsia 2003;44:1406-12. 16. Clemens B, Puskás S, Bessenyei M, Emri M, Spisák T, Koselák M, et al. EEG functional connectivity of the intrahemispheric cortico-cortical network of idiopathic generalized epilepsy. 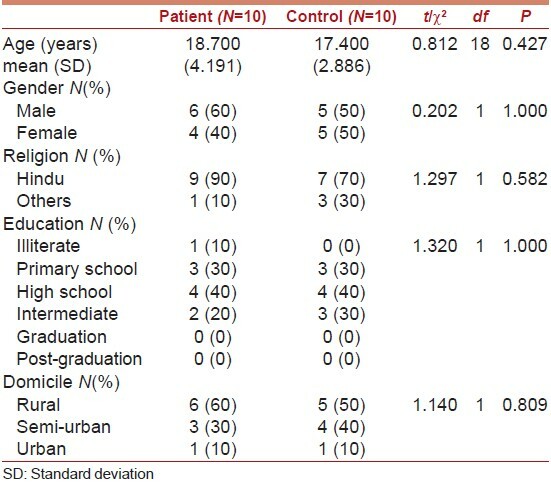 Epilepsy Res 2011;96:11-23. 17. Clemens B, Puskás S, Besenyei M, Emri M, Opposits G, Kis SA, et al. EEG-LORETA endophenotypes of the common idiopathic generalized epilepsy syndromes. Epilepsy Res 2012;99:281-92. 18. Golderberg DP, Williams P. A User Guide to General Health Questionnaire. Windsor, UK: NFER-Nelson; 1998. 19. Mandal MK, Pandey G, Singh SK, Asthana HS. Hand preference in India. Int J Psychol 1992;27:433-42. 20. Welch PD. The use of fast fourier transform for the estimation of power spectra: A method based on time averaging over short, modified periodograms. IEEE Trans Audio Electroacoustics 1967;15:70-3. 21. John ER, Prichep LS, Easton P. Normative data banks and neurometrics: Basic concepts, methods and results of norm constructions. In: Gevins AS, Remond A, editors. Methods of Analysis of Brain Electric and Magnetic Signals. Handbook of Electroencephalography and Clinical Neurophysiology, Revised Series, Vol 1. Amsterdam: Elsevier; 1987. p. 449-95. 22. John ER, Prichep LS, Fridman J, Easton P. Neurometrics: Computer-assisted differential diagnosis of brain dysfunctions. Science1988;239:162-9. 23. Clemens B, Bessenyei M, Piros P, Tóth M, Seress L, Kondákor I. Characteristic distribution of interictal brain electrical activity in idiopathic generalized epilepsy. Epilepsia 2007;48:941-9. 24. Nunez PL. Toward a quantitative description of large-scale neocortical dynamic function and EEG. Behav Brain Sci 2000;23:371-98. 25. Pfurtscheller G, Lopes da Silva FH. Event-related EEG/MEG synchronization and desynchronization: Basic principles. Clin Neurophysiol 1999;110:1842-57. 26. Gasser T, Jennen-Steinmetz C, Verleger R. EEG coherence at rest and during a visual task in two groups of children. Electroencephalogr Clin Neurophysiol 1987;67:151-8. 27. Thatcher RW, Krause PJ, Hrybyk M. Cortico-cortical associations and EEG coherence. A two-compartmental model. Electroencephalogr Clin Neurophysiol 1986;64:123-43. 28. Millson DS, Haworth SJ, Rushton A, Wilkinson D, Hobson S, Harry J. The effects of a 5-HT2 receptor antagonist (ICI 169,369) on changes in waking EEG, pupillary responses and state of arousal in human volunteers. Br J ClinPharmacol 1991;32:447-54. 29. White JA, Banks MI, Pearce RA, Kopell NJ. Networks of interneurons with fast and slow γ-aminobutyric acid type A (GABAA) kinetics provide substrate for mixed γ-θ rhythm. Proc Natl Acad Sci USA 2000;97:8128-33. 30. Leung LS, Shen B. GABAB receptor blockade enhances θ and γ rhythms in the hippocampus of behaving rats. Hippocampus 2007;17:281-91. 31. Stewart M, Fox SE. Do septal neurons pace the hippocampal θ rhythm? Trends Neurosci 1990;13:163-8. 32. Gloor P. Generalized epilepsy with spike-and-wave discharge: A reinterpretation of its electrographic and clinical manifestations. Epilepsia 1979;20:571-88. 33. Lin K, CarreteH Jr, Lin J, Peruchi MM, de AraújoFilho GM, Guaranha MS, et al. Magnetic resonance spectroscopy reveals an epileptic network in juvenile myoclonic epilepsy. Epilepsia2009;50:1191-200. 34. Woermann FG, Free SL, Koepp MJ, Sisodiya SM, Duncan JS. Abnormal cerebral structure in juvenile myoclonic epilepsy demonstrated with voxel-based analysis of MRI. Brain 1999;122(Pt 11):2101-8. 35. Kim JH, Lee JK, Koh SB, Lee SA, Lee JM, Kim SI, et al. Regional grey matter abnormalities in juvenile myoclonic epilepsy: A voxel-based morphometry study. Neuroimage 2007;37:1132-7. 36. Deppe M, Kellinghaus C, Duning T, Möddel G, Mohammadi S, Deppe K, et al. Nerve fiber impairment of anterior thalamocortical circuitry in juvenile myoclonic epilepsy. Neurology 2008;71:1981-5. 37. Vulliemoz S, Vollmar C, Koepp MJ, Yogarajah M, O'Muircheartaigh J, Carmichael DW, et al. Connectivity of the supplementary motor area in juvenile myoclonic epilepsy and frontal lobe epilepsy. Epilepsia 2011;52:507-14. 38. Uhlhaas PJ, Haenschel C, Nikoliæ D, Singer W. The role of oscillations and synchrony in cortical networks and their putative relevance for the pathophysiology of schizophrenia. Schizophr Bull 2008;34:927-43. 39. FilhoGM, Rosa VP, Lin K, Caboclo LO, Sakamoto AC, Yacubian EM. Psychiatric comorbidity in epilepsy: A study comparing patients with mesial temporal sclerosis and juvenile myoclonic epilepsy. Epilepsy Behav 2008;13:196-201. 40. Gotman J. Epileptic networks studied with EEG-fMRI. Epilepsia 2008;49(Suppl 3):42-51. 41. Devinsky O. Psychiatric comorbidity in patients with epilepsy: Implications for diagnosis and treatment. Epilepsy Behav 2003;4(Suppl 4):S2-10. 42. Tae WS, Kim SH, Joo EY, Han SJ, Kim IY, Kim SI, et al. Cortical thickness abnormality in juvenile myoclonic epilepsy. J Neurol 2008;255:561-6. 43. Béla C, Mónika B, Márton T, István K. Valproate selectively reduces EEG activity in anterior parts of the cortex in patients with idiopathic generalized epilepsy. A low resolution electromagnetic tomography (LORETA) study. Epilepsy Res 2007;75:186-91. 44. Clemens B, Piros P, Bessenyei M, Hollódy K. Lamotrigine decreases EEG synchronization in a use-dependent manner in patients with idiopathic generalized epilepsy. ClinNeurophysiol 2007;118:910-7. 45. Clemens B, Piros P, Bessenyei M, Tóth M, Hollódy K, Kondákor I. Imaging the cortical effect of lamotrigine in patients with idiopathic generalized epilepsy: A low-resolution electromagnetic tomography (LORETA) study. Epilepsy Res 2008;81:204-10.